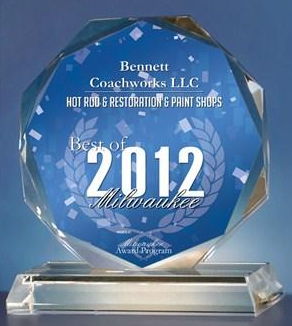 All of the work performed at Bennett Coachworks is extraordinary, unique and exceptional. These are the really "Special" projects. We think you will agree. 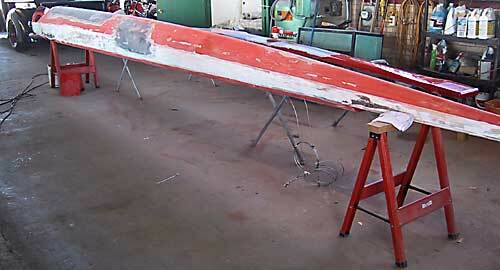 . .
Project Summary: This ice-racing sailboat, a 30' Class A Skeeter aptly named the Amphetamine 2, is a 3-Time World Champion we had in our shop for an in-depth make-over. When she left she had a lot more safety and a fresh look. We believe this craft is the first roll-bar equipped boat on the ice. We had done the existing paint work several years back. We can't reasonably take full credit, but the owner swears that a critical element in winning the championships was the lowered drag our paint work provided. Capable of speeds in excess of 100MPH, she has had a very successful season again in 2002.